Sable Falls is a waterfall located on Sable Creek in the eastern-most portion of the Pictured Rocks National Lakeshore. The Pictured Rocks National Lakeshore stretches along the shore of Lake Superior from Sand Point near Munising in the west, to just after Spray Falls near Grand Marais in the east. The name “Pictured Rocks” comes from the streaks of mineral staining on the face of the cliffs. From Grand Marais, Michigan drive 1.6 km West on H-58, turn at the easily seen Sable Falls signs and follow the signs into a large parking lot. Some information you read says that this road is rough, but it has since been paved and any vehicle can drive in here now. It is only a 1 km walk from the parking area to the falls. There is a set of stairs that takes you down almost 200 steps to the base of the falls. There is no handicap accessibility to the falls. The Sable Falls cascade down several cliffs as the river heads down to Lake Superior for a total drop of about 23 metres. The hiking trail continues down the canyon past the falls following the creek for about 1 km to a beach on Lake Superior. 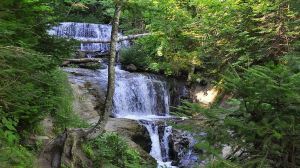 If you are looking for a longer hike, you can park at the Grand Sable Visitor Center and take the Beech Forest Trail to the falls. In the Spring there are lots of trillium flowers growing along this route.